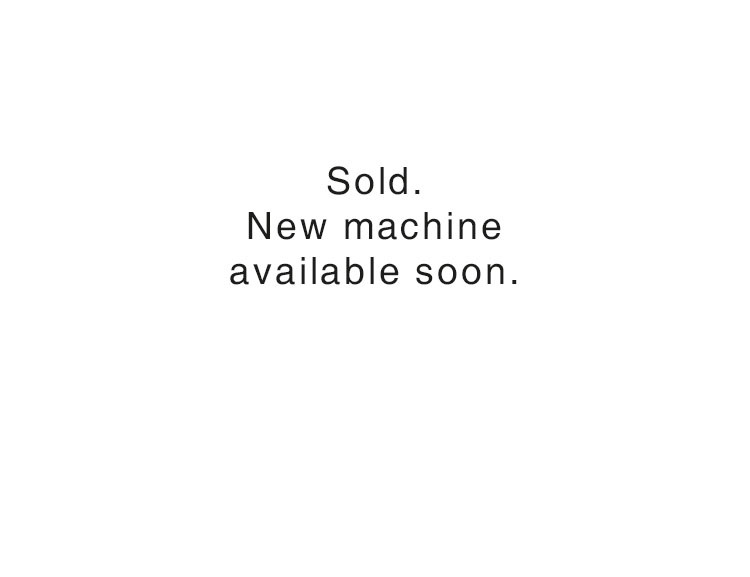 The machines listed below are available right away from stock. Spare and wear parts supply guaranteed. Contact us for further detail. It would be our pleasure to submit an offer or answer your questions. Maximum working width up to 360 mm. Mechanical knife system type KK or fixed knife sets. Time-controlled cut end automatic to stop the cutting process when working with several identical belts. Especially suitable for high quantities of small/short belts. Automatic knife guiding system based on belt edge detection. Press force adjustable up to 18 tons. Maximum press length 500 mm. Press bar width 20 mm, 30 mm or 40 mm. Press time adjustable up to 60 seconds. Built-in heating up to 80 °C (upper and lower press bar). Press force adjustable up to 25 tons. Maximum press length of 600 mm. (adjustable up to 80 °C). Press bar width 30 mm (other on request). The intermediate bar is heated. 40 mm in the width and 25 mm in the height. from the two-hand control unit. Two-hand control and pneumatic belt clamp. Machine color green RAL 6011. Standard electric supply 400 V – 3 ph – 50 Hz (other on request). Mechanical clamping device for maximum joint length of 500 mm. For belts up to 460 mm width. or up to approx. 12 cuts within 300 mm from the chassis. Cutting pressure is pneumatically adjustable. Cutting cylinder is axially movable. as well as for fixed knife sets. Knife holders are individually adjustable (positioning by hand lever). Built-in scale on the machine. Basic price without knife holder/knives. Two speed drive (approx. 0.6 m/sec and 1.2 m/sec) with frequent converter. including guiding for belts up to 6 m. Minimum belt length 1200 mm. for belts of 480 … ≈ 1800 mm. Including hand wheel for precise adjustment of belt position. working with several identical belts. Especially suitable for high quantities. 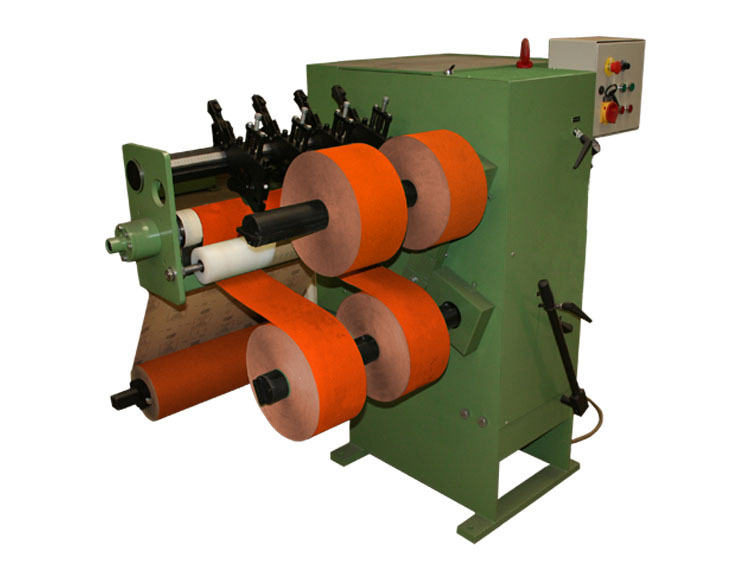 Continuously working skiving machine developed for preparing the joints of the endless narrow and wide belt production. Two-speed drive (approx. 0.05 m/sec and 0.1 m/sec). 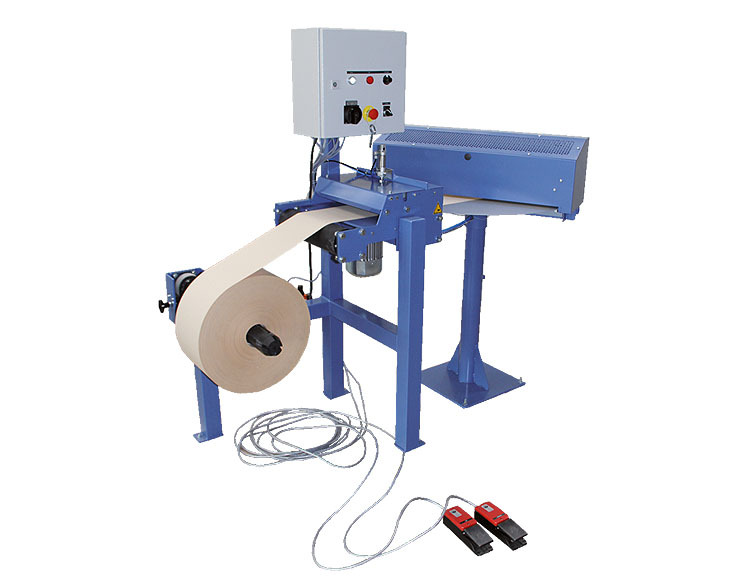 Perfect for the production of non-woven materials (up to 6 mm). Length 6000 mm with inserting stretch 500 mm (extension of inserting stretch on request). Working direction from right to left (standard). Material is passing through with grain side up or down (for tape joints and overlap joints). Easy adjustable scuffing and gluing aggregates. Simultaneous preparation of both lap ends possible when producing long belts. 2 aggregate type D, for skiving the grain with a diamond cup wheel from the top. 1 aggregate type C, grinding and scuffing with an abrasive belt from the top. 1 aggregate type P, pointing or scuffing with an abrasive belt, a wire brush or other tools. 2 glue spray head type LS or roller type G (working from the top). 2 meter drying stretch type T (working from the top). 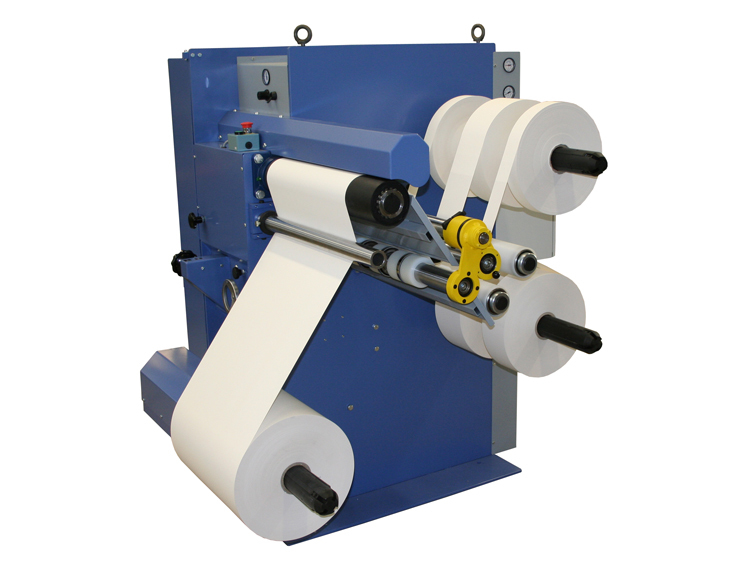 it applies the tape automatically on one lap end and finalizes the procedure with a flush cut. 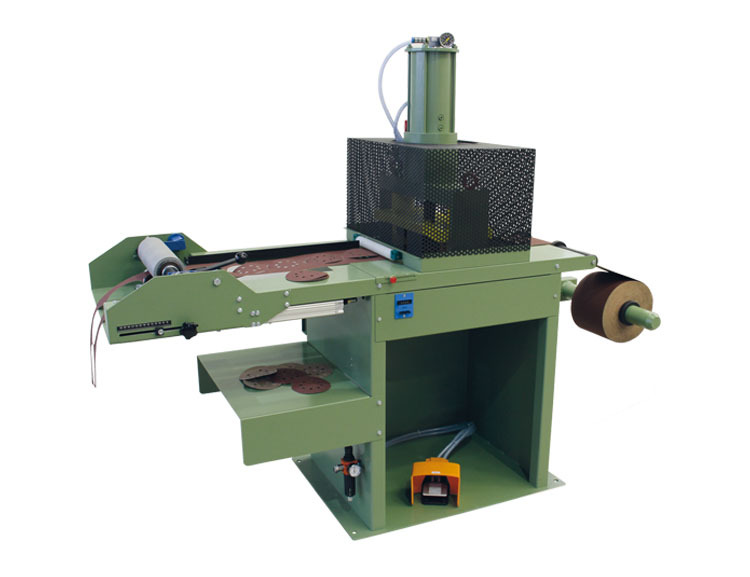 The machine is suitable for direct attachment to any skiving machine type 494. (can be loaded from the side – no hoisting system needed). Cutting angle is adjustable from 45° up to 90°. Pneumatically expandable unwind shaft for cores with ø75 mm. Automatic feeding and measuring system. The material will be fed. Minimum feeding length of 200 mm. The material should be as flat as possible. Measurement accuracy of approx. 1 mm or 0.1 % of cut length. The length and number of cuts can be entered digitally. 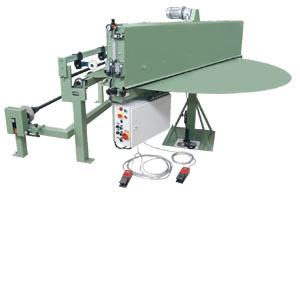 Guillotine cut-to-length machine type SGW (hydraulic guillotine). For straight cuts and wave cuts. Maximum cutting length with straight cut 720 mm. Material will be inserted into the skiving machine with the grain side down (for tape joints). Cutting length up to 1850 mm. 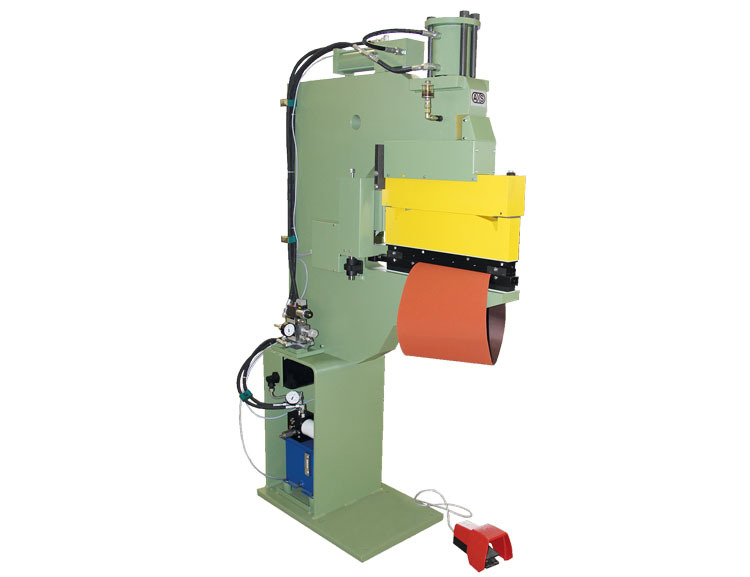 Crush cut system for straight cut and wave cut (wave form type 20800). Foot operated cutting (knife is moved by an electric motor). Cutting angle adjustable between 90° and 45°. Crush cut against replaceable steel strip. Pneumatic clamp to hold the material during cutting. Material is passing through with grain side up. Machine can be turned on its pedestal. Maximum roll width up to 1650 mm. Maximum roll diameter 750 mm. with flap bearings for pneumatically expandable unwind shafts or square shaft with cones and manually adjustable mechanical brake. Belt support with a hardened, fixed steel shaft type F.
Type TV: automatic partial feeding of the material through the cutting machine. Maximum cutting length 500 mm. Shear cut system for straight cuts (no wave cuts possible). Cut with dished knife against „throw-away“ blade. 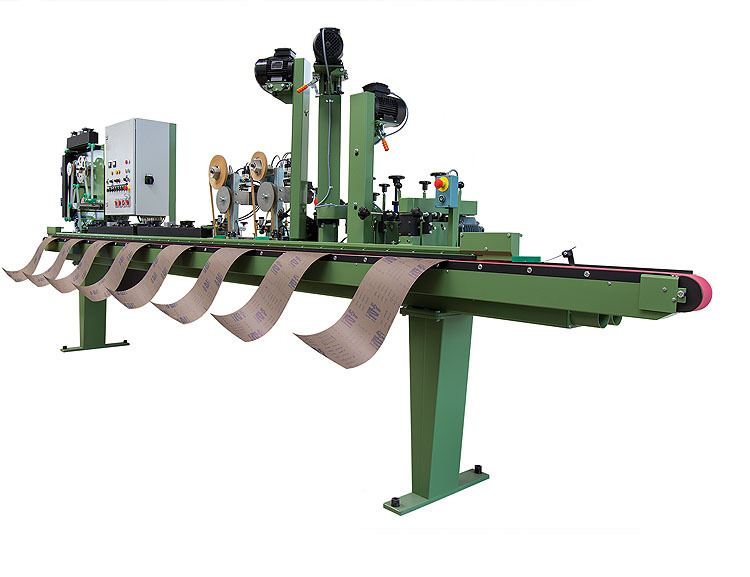 Automatic partial feeding type TV through the cutting machine. Unwinding with pneumatically expandable unwind shaft as well as mechanical brake. For rolls up to 620 mm width (working width 610 mm). Unwind station for rolls up to ø600 mm. Crush cut with mechanical knife system KK or fixed knife set. Pneumatically adjustable cutting pressure (max. 4000 kp). Built-in scale for cutting width adjustment. Rewind station for rolls up to max. ø400 mm. Web tension is separately adjustable for both shafts. and rewind station (instead of mechanical ones). Cutting pressure, brake and web tension are adjustable. For rolls up to ø600 mm. Discs of ø90 … 300 mm. Discs/sheets with or without center hole as well as with or without suction holes. with adjustable range of 80 … 310 mm (for scrap web). to stop the machine after the pre-selected number of cuts is reached. Compressed air of 6 bar. 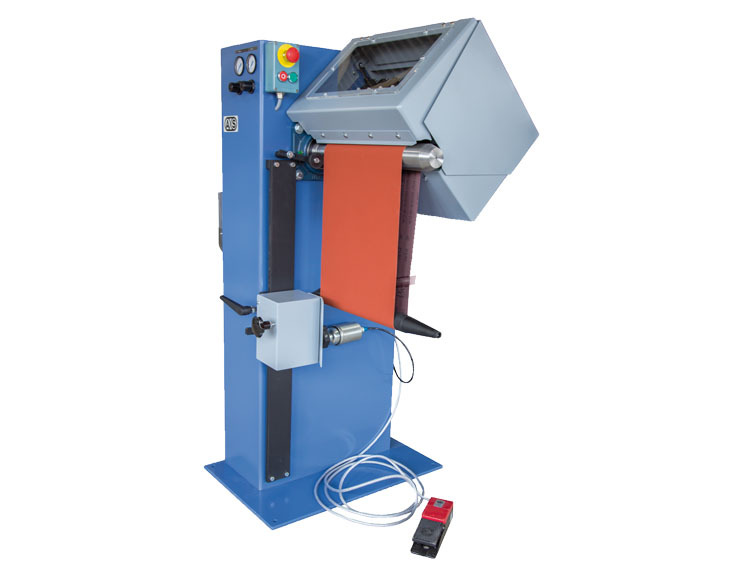 Machine for punching discs up to ø225 mm of flexible and coated abrasives. Crush cut system and directly from narrow rolls. Unwinding with fixed shaft and 2 board discs. For roll widths up to 320 mm and a maximum roll diameter of 600 mm. For discs with a maximum diameter up to 225 mm. Maximum cutting force 250 kN (25 t). (depending on disc diameter, material and feeding length). Up to 3 time higher with multi tool and multi-layer punching. Adjustable penetration depth of the blades (steps of 0.05 mm). Continuously adjustable cutting force with hand wheel. Digital display in bar (15 … 120 bar). (endless counting up or counting down with automatic stop). Adjustable feeding system 80 … 300 mm. the adjustment of the punching tools (cutting depth and cutting pressure). Collecting tray for the punched discs. center holes, suction holes etc. Ejector cylinder for pushing the punched material into the collecting tray. 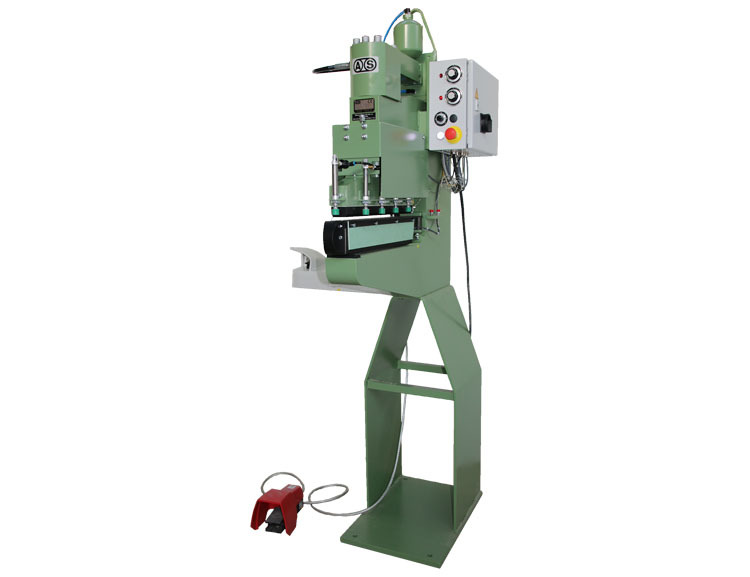 Automatic rotation of the punching support to reduce wear.